Getting out in the great outdoors is always good exercise, but you know, you can even get a workout INSIDE the RV. Jodie Ginter is an RV enthusiast, who along with John Holod, creates some excellent RV videos. Ginter says she’s logged more than 250,000 miles in her travels. She offers a video to keep us RVers in shape on the road…and even in the limited space of an RV! What’s cool about Jodie’s video is that you don’t need equipment and it only takes about 25 minutes to get in your workout. 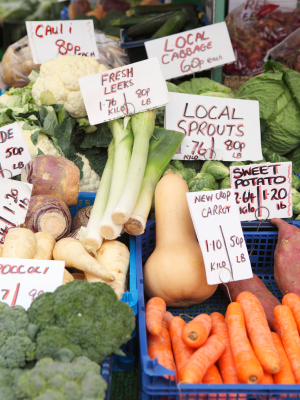 I love finding the freshest in-season produce at local farmer’s markets! I also try to keep the kitchen in Max, my Airstream, stocked with some healthy options (when I’m not taking in the festival food!). AllRecipes.com has some great info on what to stock in your RV so you can always be prepared for cooking on the road. When I’m visiting some of the fairs and festivals around the country, one of my favorite things to do is find the farmers markets. Many of them are wrapping up for the summer, but several stay open later in the year to sell their fall crops. Fresh broccoli is one of my favorite veggies and is a fall staple of mine. Some farmers markets will have a bounty of broccoli right through October. I stopped at one on my way back from Georgia and picked up some ingredients for a broccoli salad recipe I found some time ago and thought I would share it with my readers. This salad is easy to make on the road or at home…and you can make it as healthy or as decadent as you’d like. It’s one of my favorites for a variety of reasons: it’s tasty, it’s nutritious, and since Scamp and Rambler are not fans of broccoli, there’s no begging for food when I eat this one! The recipe calls for enough ingredients to make the salad for a whole batch of campers, so adjust accordingly. I went for the healthy (or at least healthier) version. Cook the bacon over medium high heat until it’s crispy. When it’s cool, crumble it up. Cut the broccoli and red onion into smaller pieces, place in a big bowl and combine it with the bacon, raisins and almonds. In a separate bowl, mix the mayo, sugar and vinegar until smooth and stir it into the salad. Let that chill for a while and then serve it up. It’s that easy! Do you have some good on-the-road recipes? Share them with me, and I’ll pass them along right here on the blog! *Disclaimer: RV.com, which is owned by Dometic Corporation, sponsors On the Road with Robin. Neither Dometic Corporation, nor RV.com, provide this blogger with free Dometic products, and this blogger does not receive a commission on click-throughs from links on this blog to RV.com, Dometic.com, or any other site. All references made to product brands are made in an attempt to provide readers with the knowledge necessary to recreate the experiences mentioned in this blog. For those of you who read this blog, you’ll remember that last month I gave some suggestions about how best to travel with your pet (in my case, my dogs). That post prompted an emailed from one of my readers asking about how to deal with a dog’s car sickness. I’m fortunate that that hasn’t been a problem for me personally – Scamp and Rambler have always tolerated the motion as we drive along. They’re relatively young, too, which I think helps, but what do I know, I’m not a vet. I’ve compared notes with other RV friends and acquaintances who travel with their dogs, and recently I’ve been hearing about a drug called Cerenia®. I think it comes in tablet form, and from what I’ve heard, it’s worked pretty well for combatting car sickness for a number of dogs. 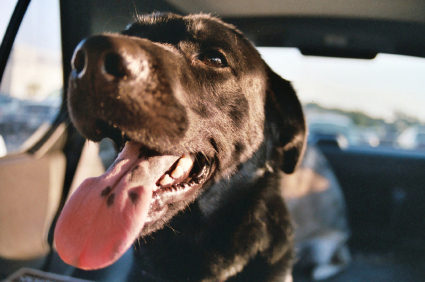 If your dog is demonstrating car sickness, especially when he or she hasn’t before, I suggest you call your vet first to ask about this drug, but this might be just the ticket. This whole issue of animal health on the road has given me pause lately to really think about the idea of how long I’ll be traveling with my dogs. As much as Scamp and Rambler seem to enjoy the experience, I realize that they can’t really tell me how they feel, so it is important for me to keep a close eye on their health and happiness. We all make decisions for our pets and hope they’re the right ones. I mention this because I had a couple of friends recently who had begun to ask themselves about their aging dog and how well he was tolerating the travel. Joe and Hazel have been retired for about four years and bought their Class C RV so they could enjoy the travel they’d never had time to do when their kids were growing and “life got in the way,” as Hazel put it. Their dog, Festus, had been a part of the household for about seven years when they started to hit the road to see the country and visit their grown children who had spread all over the map with their families. They told me that up until recently Festus had tolerated the travel very well, usually riding up front with them, and accompanying them on their adventures. Sometimes it was difficult to tell who the grandchildren were happier to see, Grampa and Gram (as Joe and Hazel were called) or Festus, who became the immediate center of attention when Joe and Hazel pulled in. But, as Joe told me, Festus began to be out of sorts more often when traveling and he’d had a couple of times when he’d acted as though he was car sick, once when they had been traveling a mountain road with its switchbacks and frequent turns. Joe was the first to bring up the subject of whether or not it was time for Festus to “retire from the road,” as he put it, but Hazel didn’t want to talk about it at first. Knowing that Joe was right (he usually was), Hazel finally suggested they ask if Festus could spend his “retirement” living with their middle daughter, Cleo, and her husband, Paul. They were fortunate in the fact that Cleo was a stay-at-home mom and Festus could be around people all day as a play companion to their two girls. And, of course, they’d be able to see Festus when they visited Cleo and her family. So, on their last trip, Festus stayed behind when Joe and Hazel pulled out. Hazel had a hard time leaving Festus but knew they were doing the right thing. She simply missed her companion. But, as she told me one night as we sat enjoying the night sounds after a dinner we shared, “We make choices for our pets and it’s important to remember that those decisions not be just about us. It has to be about them, too.” For me, hearing this story made me aware that I may face the same questions some day with Scamp and Rambler. I love having them with me but what’s best for them will always be the priority. I hope the same will be true for you. You may remember that before I traveled to Kentucky for Thunder Over Louisville and stayed around for the chance to see the Kentucky Derby I made the decision not to take my usual traveling companions, Scamp and Rambler, my dogs. They instead enjoyed a vacation from me thanks to the kindness of my two favorite Nashville friends, Anne and Chet. When I got back and pulled in to their place towing Max, my Airstream, and the dogs got a glimpse of their home on the road, it was difficult to contain their enthusiasm. (I’m not sure who was most excited – the dogs or Anne and Chet. Scamp and Rambler can be a handful.) I’m thankful these separations are rare and they make me realize how important my dogs are to me. They are part of my family. When I was in Kentucky, I told a couple I met at the campground that I had left my dogs behind with friends in Nashville and they asked me about the experience of traveling with Scamp and Rambler. They said they were considering getting a dog to join them on their travels and wanted to know about my experiences. I talked to them for several hours and later I thought I would make it the subject of this blog. However, it’s such a broad topic I decided to confine this blog entry to things to think about while you’re actually on the road with your dogs. 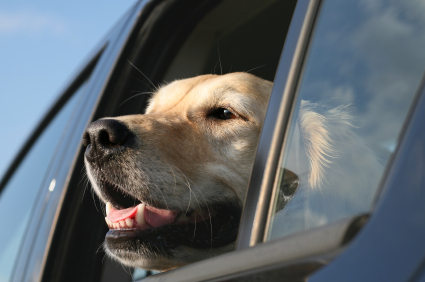 Keep Your Pet Safe When Your Vehicle is Moving. Years ago, I let my dogs sit next to me in my pickup truck while we drove but after reading about some tragic accidents in which pets had been injured, I made the important decision to fit them with restraints. I use seat belt harnesses for both of my dogs. I won’t give you a brand name because there are a lot of alternatives for how best to keep your pet safe, including harnesses and plastic or wire travel crates, and it has to be a personal choice for each pet owner. But I would urge you to research all of the possibilities and pick what’s best for your situation. Your pet will thank you. Make sure you take up-to-date veterinary records for each of your pets, including vaccinations, and license tags, of course. A lot of campgrounds require you to have certificates of things like rabies inoculations. It’s a good idea, if you plan your trip ahead of time, to learn of veterinary resources where you’re going and emergency numbers. It’s also a good idea to have a picture of your pet, digital or printed, in your file. Take plenty of Rest Stops Along the Way. This is not only for – how shall I say – the “relief of nature” but also for a little exercise. Every few hours is a good rule of thumb. Make sure you take plenty of disposal bags and clean up after your pet. Remember, you love your pets, but many others do not, and you would not want to be thought of as a nuisance. Try to keep your pet’s feeding schedule as near to your home timetable as possible. Routine is important for them even when you’re all on the road. Cleaning supplies are a must, of course, because accidents do happen and car sickness is not a problem confined only to humans. After covering much of what I’ve written here when talking to the people who had asked me, I perceived a look on their faces of “Uh oh, this sounds like a lot of trouble.” I would be lying if I didn’t concede that taking a pet – in my case, two dogs – on the road requires a major commitment of time, patience, planning and, yes, expense, but I can tell you quite honestly it’s more than worth it. Scamp and Rambler are like my children, and I wouldn’t trade my experiences with them as an RVer for anything. There is nothing quite like taking them on a leash to walk a trail in a wilderness or to sit around after dinner in camp and listen to the night sounds. Be awakened just once by a cold nose nudging you in the morning to get out of bed and you will know the joy that I feel when I think about Scamp and Rambler. They’re more than my pets. They’re my traveling companions. Follow the signs and follow the rules! I got the nicest response to my last blog entry from a woman named Debra, and I’m just now taking the time to acknowledge it. Because of what she asked, I thought it might be nice to share my answer through the blog since it concerns something a lot of people – well, at least the people who like to read my blog! – might wish to know. She wrote that she and her husband were going to be renting an RV for the first time this summer and she was looking for some “rookie” tips from an old hand like me. As I was thinking about what to tell Debra, it occurred to me that there is one overriding theme that seems to be common to every situation and to every interaction you’ll have. It has to do with courtesy. 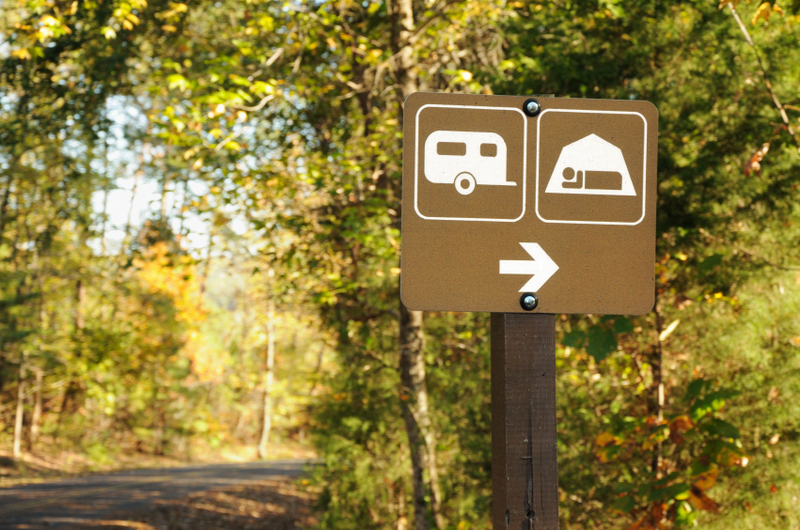 Since most of us RVers tend to stay in campgrounds or RV parks, that’s a good place to start. The first tip I’d pass along is to learn the campground’s or park’s rules as soon as you get there (or even before, if they have a website). You’ll find they’re usually written to insure you enjoy your stay and to allow others to enjoy theirs. When you get there, take a look at how others are parked. Generally, you’ll want to try to orient your RV the same as others. Are you pulling in late at night or leaving especially early? Try to make as little noise as possible or not burn lights too late or too early that may disturb others. Have a firepot there in the space? Use it for fire only, not as a makeshift garbage can. Got pets? (Boy, do I have pets!) I love my dogs, Scamp and Rambler, but I realize not everyone else likes pets, so I’m always careful to keep them under control. It’s just simple courtesy when you think about it. Try to conduct yourself so that you leave nothing behind but a good memory of your visit for those you get to know on the road. If you are looking for more tips for beginner RVers or for tips for camping on your own like I do, check out RV.com’s RV Lifestyle Tips. I’ll conclude with one of my favorite memories about being an RVer and the whole idea of treating others as you would like to be treated. I was spending the night in a campground in a swamp on the Louisiana-Texas border a few years back when I first started the RV life. The campground was pretty bare-bones, it was miles to the nearest grocery store and it was the middle of the week. There were only a few RVs there. The couple from the next occupied space – about four down from where I was parked- was trying to prepare their dinner. He was manning the grill, she was in their galley. A few minutes later, the wife walked over to my Airstream, Max, and, after apologizing for intruding, asked if I had any cumin (the spice) I could spare. As luck would have it, I had about two teaspoons left in a spice tin and offered it to her. She protested that she couldn’t take the last of what I had but I insisted, since I wasn’t going to use it anytime soon. She thanked me repeatedly and went back to their motor home. Do unto others…that’s the one tip I’d pass along as essential. Keep that in mind and you’ll be fine.